One dedicated Cubs fan just saw their dream come true. CHICAGO (WLS) -- Last month, Special Olympics athlete Stefan Xidas struck a deal with Chicago Cubs owner Tom Ricketts. If Stefan, raised $5,000 for the Special Olympics, he would get to sing the national anthem at Wrigley Field. Stefan made good on his part of the bargain, raising $11,000 for Special Olympics. Now the Cubs are making good on theirs. Special Olympics athlete Stefan Xidas wants to strike a deal with the Chicago Cubs. Standing under the world famous Wrigley marquee, it's starting to sink in that he will be singing the national anthem at Wrigley Field on Monday night. "The moment came to me when the Cubs won the World Series in 2016 that I will give anything to make my dream come true, now it's finally here and it's amazing to see that this is the year I would do it," said Stefan. "I have been a Cubs fan for as long as I can remember." Stefan Xidas has been on a mission for more than a decade. 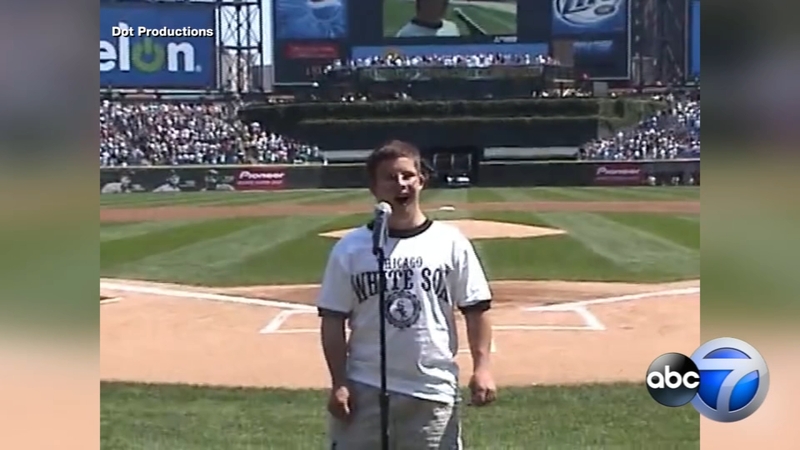 "It has been a lifelong dream of mine to sing the national anthem at the Cubs game," he said. But after years of unrequited offers, Stefan's best friend had an idea. "Let's film it and raise some money for the Special Olympics," said Stefan's friend tom Molitor. "I started a GoFundMe page to raise money for the Special Olympics organization," he said. Stefan far exceeded his fundraising goal and Cubs Charities called with the invite. "And when he found out I said 'Stefan, you know there is going to be 40,000 people there,'" Molitor recalls. He's no amateur. At age 17, Stefan sang the national anthem at then U.S. Cellular Field. The last time Stefan sang at a Chicago major league ballpark was 2005 and that was on the South Side. That was also the year the White Sox went on to win the World Series. "The fact that I'm doing it now will definitely bring the Cubs luck," Stefan said. Stefan's already warming up. Ready for the moment he's waited his whole life for. Cubs Charities have matched Stefan's fundraising efforts, donating over $22,000 for Special Olympics.